Home / Stock Picks / Hot Stocks / Will Disney Stock Be Crushed by Netflix, Amazon and Streaming? Will Disney Stock Be Crushed by Netflix, Amazon and Streaming? Investors — myself included — were riding high for several years in Walt Disney Co (NYSE:DIS). Shares rose from $38 in 2012 to more than $120 by mid-2015. Disney stock was an absolute beast. Earnings were churning and sales growth was strong. The company hit continuous home runs on the movie slate. Theme parks were strong and Shanghai Disney Resort was opening soon. CEO Bob Iger could’ve let a Mouseketeer run Disney for a week and business would’ve still been fine. Tom Staggs, the former COO that many pegged as the future CEO, stepped down in April 2016. The move was a blow to shareholders, as many were comfortable with Staggs and were preparing to see him at the helm when Iger left. The on-demand revolution led by Netflix, Inc. (NASDAQ:NFLX) and Amazon.com, Inc. (NASDAQ:AMZN) has been a big blow. But it’s only one element. Alphabet Inc (NASDAQ:GOOG, NASDAQ:GOOGL) is in the race with YouTube, offering a TV look-alike for $35 a month. Countless skinny bundles have also hit the market. But it’s not the end of the world. For starters, those skinny bundles and YouTube offerings still benefit Disney. Granted, it’s not the most ideal situation, but this isn’t exactly a losing venture for DIS. Additionally, it owns 30% of Hulu, another popular streaming platform. Streaming isn’t crushing Disney stock, at least not yet. But it feels like it will if the entertainment giant doesn’t adapt. For starters, Netflix makes mincemeat of Hulu, which has always felt like a side project from its owners — Disney, Twenty-First Century Fox Inc (NASDAQ:FOXA, NASDAQ:FOX), Comcast Corporation (NASDAQ:CMCSA)(via NBCUniversal) and Time Warner Inc. (NYSE:TWX), soon to be AT&T Inc. (NYSE:T). The fact that the trio (initially just CMCSA, FOX and DIS before they sold 10% to TWX) tried to sell Hulu before pulling it off the auction block, says just that. They obviously weren’t too interested in Hulu being a head-to-head NFLX competitor. That trio has a combined market cap of nearly $250 billion, not to mention some of the best programming on the market. Surely they could make Hulu a dominant player, but they don’t seem interested. Disney’s biggest blunder was not buying NFLX when it had a sub-$10 billion market cap in 2012 and 2013. Sure, it would have been a drag on earnings then and a free-cash flow burner now. But the revenue growth and increased market share would’ve made it all worthwhile. It would’ve positioned Disney for the next era of content consumption. But that’s neither here nor there — and NFLX isn’t Disney’s only concern. At least NFLX is burning its own cash and has a crazy-high valuation. 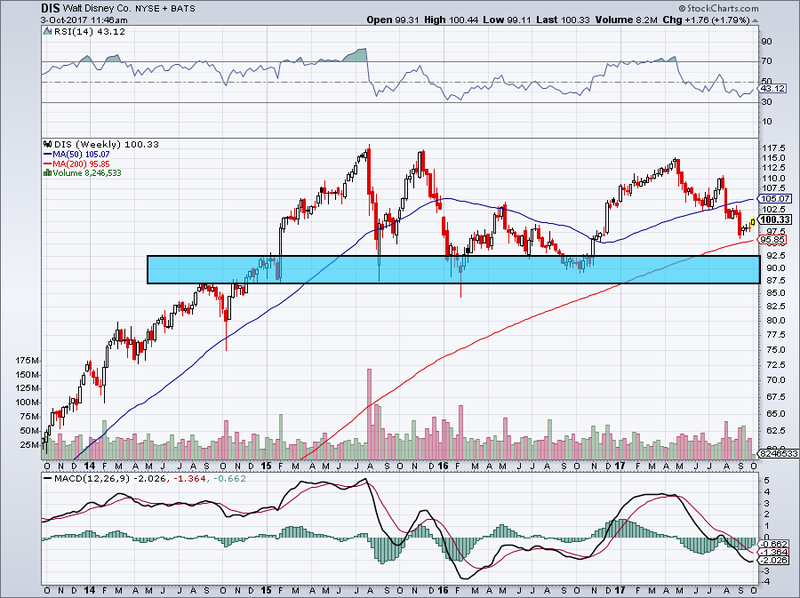 Facebook Inc (NASDAQ:FB) and Apple Inc (NASDAQ:AAPL) don’t. Should those two have success generating their own content, DIS and others could be in big trouble. Not that DIS would disappear — at least in skinny bundles, Disney still gets paid. But if Apple and Facebook generate their own studio content (which they are doing) and run it on their platform, Disney stock is in trouble. Not to mention, with seemingly endless budgets, Facebook and Apple could easily outbid everyone for sports content. That would be a lethal blow to Disney stock. Management is making changes, though. Recent plans include ditching Netflix (despite it paying hefty prices for Disney content) and plans to create its own streaming platforms. This could be good for Disney, assuming its product catches on. The risk is that it doesn’t. Through nine months this year, revenue is barely positive. Park revenues — thankfully — represent about 30% of total sales. This is up 9% year-over-year. Media Networks revenue is actually flat (think ESPN, ABC, etc.). Earnings growth will be minimal this year, not even 2%. Analysts expect 11.4% growth in 2018. I would expect Disney stock to rally if it can meet these expectations. 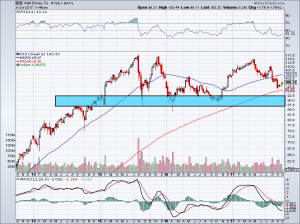 Ultimate support sits between $87.50 and $92.50. Disney stock is not a value trap, but some will question how much value it really has at these levels. My belief is that Disney will be relevant five, ten and twenty years from now… but the next few could be bumpy. Disney could be a game-changer in streaming, but if its efforts are equivalent to what Hulu has become, Disney stock could be in for more trouble. I wouldn’t give up on Disney yet. But its clock is ticking in terms of staying atop the content pyramid. Bret Kenwell is the manager and author of Future Blue Chips and is on Twitter @BretKenwell. As of this writing, Bret Kenwell held a long position in DIS. Article printed from InvestorPlace Media, https://investorplace.com/2017/10/disney-stock-crushed/.